Reading is an everyday and 21st century necessary skill. Reading happens every day. Everywhere you look you will see print. Signs, menus, food containers, articles and, yes, even social media feeds. However, students need to read books and articles critically and with good comprehension. With a 20 minute a day mantra starting at an early age their success can be achieved. There are many benefits of reading which include providing connections, obtaining knowledge and gaining experiences. 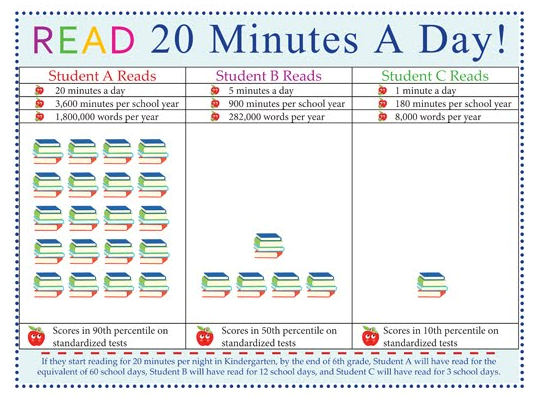 Reading 20 minutes a day helps increase student success in school and beyond. Even before a child enters kindergarten being read to increases listening skills, phonemic awareness (sound to letter awareness), and vocabulary which in turns builds comprehension and understanding of the world around them. Much of academic success depends on the ability to read well. Reading practice exercises the brain and builds its abilities. Reading 20 minutes a day will help your child to be academically successful. Above all else, showing interest in reading with your child helps to build life-long learners. You have a special opportunity to share with your child daily whether it is snuggling up on couch or reading before bed or even in the car. A love for reading begins at home.